Soc. Mycol. France Bull. 5: 67. 1889. Fruiting body perennial,woody, typically sessile, 6-60 cm broad, 5-10 cm thick, fan-shaped to slightly convex, rarely hoof-like, usually solitary; margin rounded early, becoming narrowed at maturity; surface a hard crust, dull grey, grey-brown to brown, irregular, often furrowed, nodulose and zonate, frequently dusted with brown spores. Flesh up to 6.0 cm thick, brown, tough, corky, blackening in KOH. 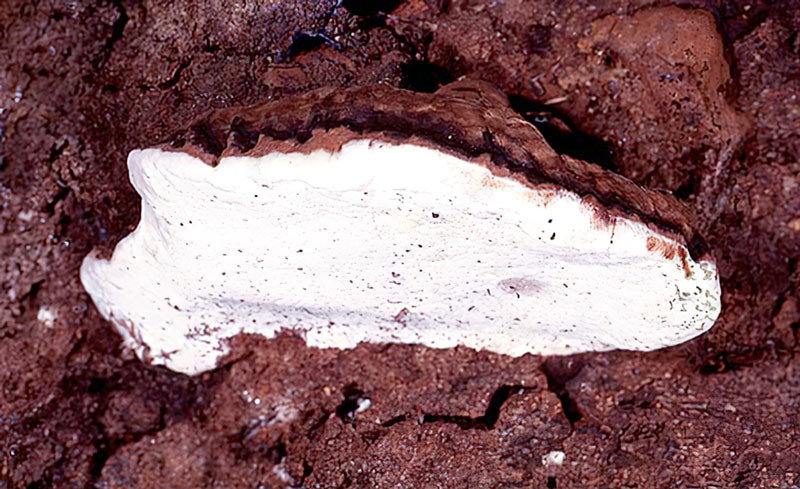 Pores 4-6 per mm, white, quickly bruising brown when injured, fading to pale yellowish-buff when dried; tubes multi-seried, 4-13 mm long, brown, each layer separated by a thin layer of tissue; tubes and pores blackening in KOH. Spores 6-9.5 x 5.7 µm, broadly elliptical, blunt at the distal end, thick-walled, ornamented with minute spines; spores brown in deposit. Solitary or in small groups on downed logs of both hardwood and conifers, also on living trees; especially common on Umbellularia californica (California bay). 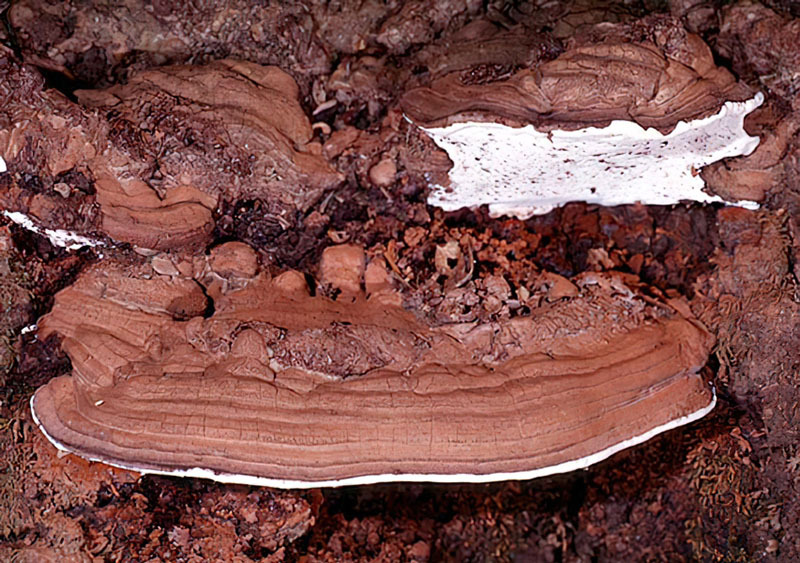 Our best known shelf fungus, Ganoderma applanatum is distinguished from other woody polypores by a dull grey-brown, bumpy, usually zonate cap, often powdered brown from released spores, and a white pore surface which instantly darkens when injured. 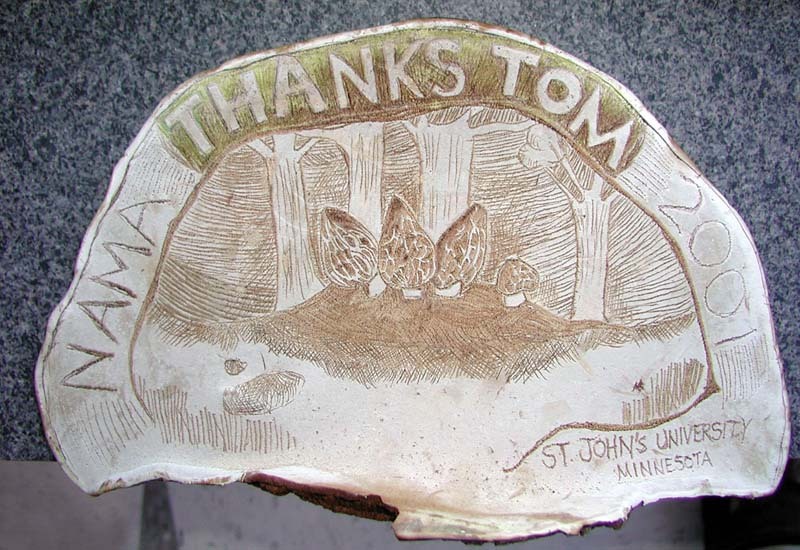 The latter feature makes it a favorite of artists which use the smooth white surface as a canvas. Like a number of perennial woody conks, the age of a fruiting body can be roughly determined by sectioning and counting the tube layers. 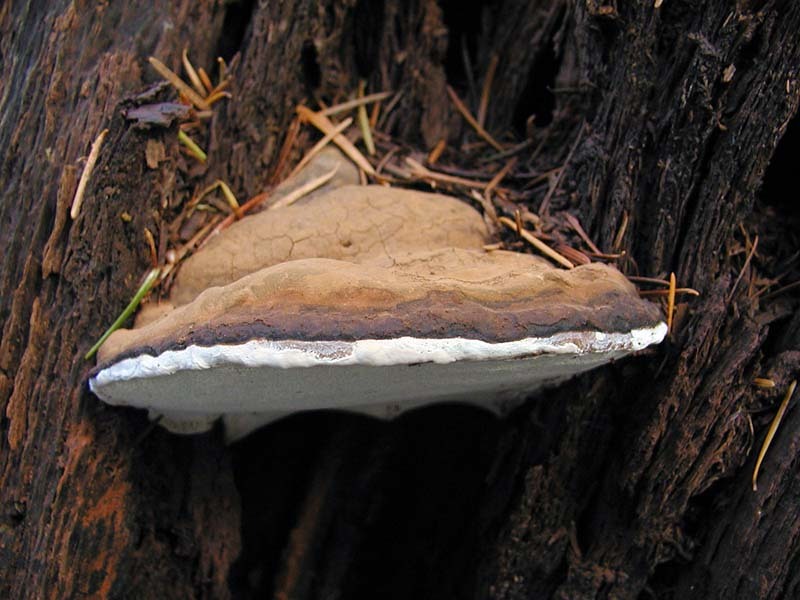 Related fungi include Ganoderma tsugae, uncommon in our area, with a shiny red/brown to mahogany brown cap and pores that do not bruise and Fomitopsis pinicola with a reddish-brown cap margin and pores that bruise slowly pale yellowish-buff. 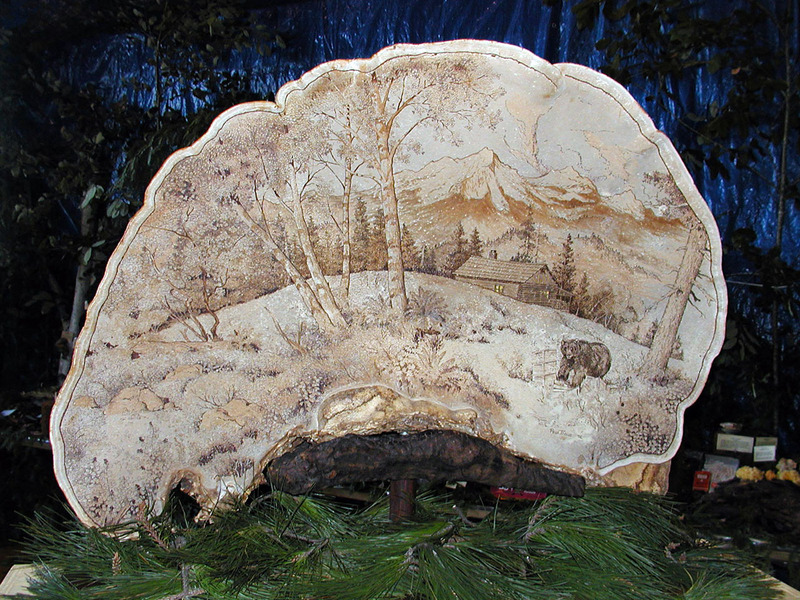 One other Ganoderma that occurs in California is Ganoderma brownii. 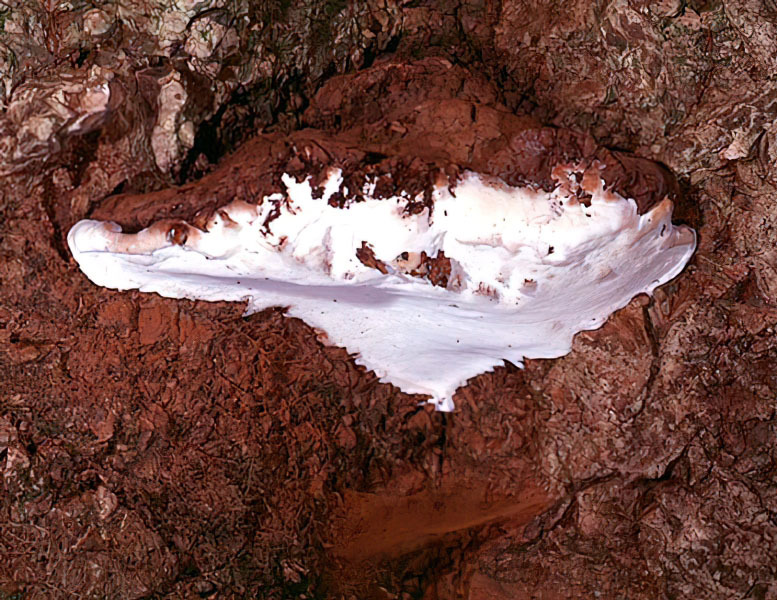 According to Gilbertson & Ryvarden, it is similar to Ganoderma applanatum but differs in having larger spores and a yellow pore surface. Gilbertson, R.L. & Ryvarden, L. (1986). 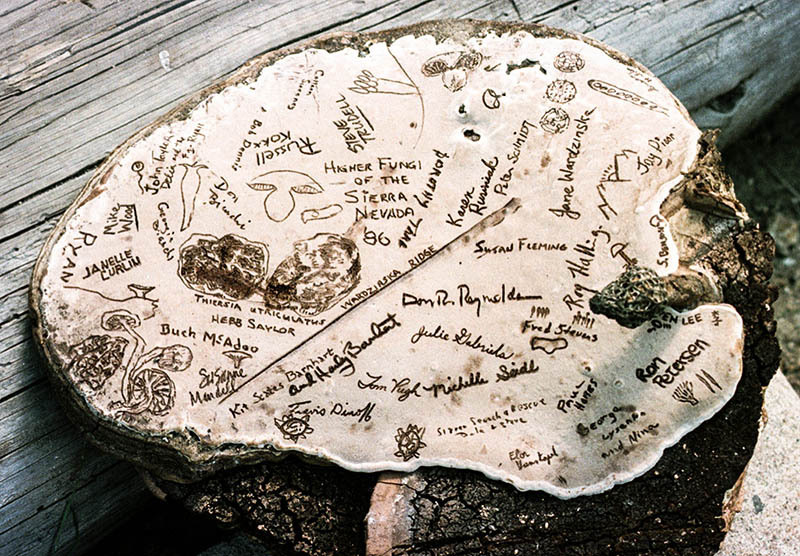 North American Polypores, vol. 1. Fungiflora: Oslo, Norway. 433 p.